Our 3M™ Fire Barrier Duct Wrap 615+ (PDF, 332.91 Kb) is a fire-rated duct wrap consisting of an inorganic fiber blanket encapsulated with a scrim-reinforced foil. Because the blanket is adhered to the foil scrim it will resist wrapping and slumping. This non-asbestos wrap installs easily due to its high flexibility, low weight and thin profile — making it an ideal choice for duct enclosure systems. (PDF, 288.6 Kb) It is a proven alternative to 1- and 2-hour fire resistant shaft enclosures for grease ducts. 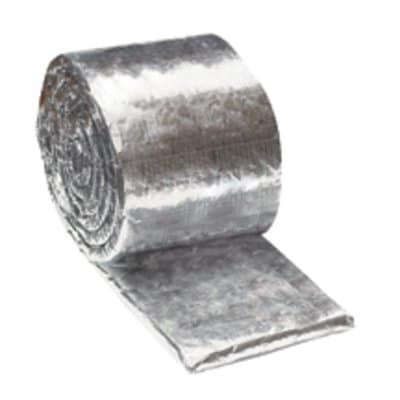 3M™ Fire Barrier Duct Wrap 615+ performs in temperatures up to 2192°F/1200°C. 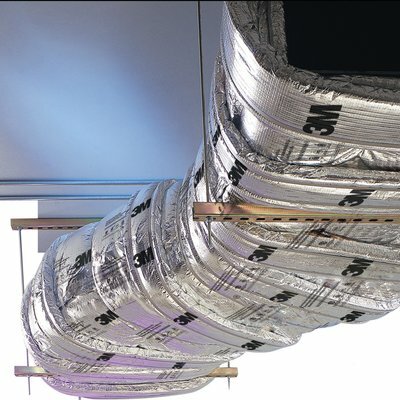 3M™ Fire Barrier Duct Wrap 615+ is the only fire-rated duct wrap product you'll ever need to help protect both grease ducts and air ducts while passing the necessary fire tests to achieve up to 2-hour fire-resistance requirements. It is third party certified to ASTM E2336 (grease duct test standard) and ISO 6944 (air duct test standard). It is tested and listed with UL and Intertek, meets IBC, IMC, UMN, NFPA and other key life safety codes. It is listed by California State Fire Marshall (listing No. 2440-0941:5555).